Someone is getting their taxi pushed,I think its the Barbies? Vocieover: The Cho brothers are the nicest guys in the race while the beauty queens are..
Chos: we had to work with the blondes. Barbie Conf: if we were the last two teams on earth I don't think that we could work together. Vocie: will nice guys finish last? Barbie Conf:we gotta get rid of Erwin,Godwin..
Barbies in car:theres only room for us, no place for them.Which is the way we like it. 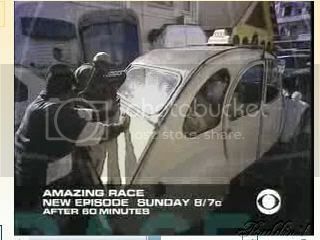 Voice: the teams of the Amazing Race have made their bed.Now they'll have to carry it. It wasn't hard to scare up a picture with the phrase "tana taxi." Still a lot of Citroen 2cV taxis in use (source). Looks like the Sixpack will have a VERY EMOTIONAL next leg! Still no shots of J/T or R/K doing mattresses? Could they have gone for the FF? I still don't understand how the FF will work this episode. My guess is that after the tag-team Intersection mattress task, the teams can go for the FF. Makes sense but why would they get the FF envelope at the Intersection? If they have do to the Inersection first wouldn't they not receive the FF envelope until they've complete the Intersection? Can anybody help with a timeline and summary of what we know about this episode? --where do cow lips come in?? could that be the FF??? Titleist ??Mary?? --Do we know ANY Detours or Roadblocks? --something with taxi?? (Traffic drives on the right. Bus: A flat fare is charged, irrespective of the distance traveled. Services can be unreliable and buses tend to be crowded. Taxi: Flat fares apply except in Antananarivo and Fianarantsoa, where fare is calculated according to whether the ride is confined to the ‘lower town’ or goes on to the ‘upper town’. There are two types of taxi: the taxi-be, which is quick and comfortable, and the taxi-brousse (bush taxi), which is cheaper, slower, makes more stops and generally operates on cross-country routes. Fares should be agreed in advance and tipping is unnecessary. Rickshaw: The pousse-pousse (rickshaw) takes passengers except where traffic or gradient renders it impractical. Prices are not controlled and vary according to distance. Stagecoach: A few covered wagons continue to take passengers in Antananarivo. Car hire: This is not widespread and car hire agencies can only be found in the main tourist towns. It is advisable to make enquiries in advance about insurance requirements for car hire. Motorbike hire: Available from several companies in Madagascar. Documentation: A national driving license is sufficient.) Heee...covered wagons! --Pitstop?? up on a hill in Tana-- (Presumed: D/M eliminated w/ T-shirts willed to Cho's and Bama's) Order of arrival?? --depart for Helsinki on June 15 (Air Madagascar operates four direct flights between Paris CDG and Antananarivo each week. British Midland operates a connecting service from London Heathrow, Leeds-Bradford, East Midlands and Edinburgh. You can also fly from any UK airport served by Air France for an extra charge. ...can fly to Paris ... to connect with Air France service...Alternatively, you can fly to Johannesburg and connect with the Air Madagascar or South African Airways service.) OR could they leave on that late night flight to Helsinki on June 14th in some weird "keep on racing" leg...with another 16+ hours of flying, it's hard to get them to Helsinki on time! --possible flights: air France via Paris then finnair leaving 12:50AM arr either 4:25PM or 7:25PM OR air Madagascar via Paris dep (9:50PM arr2:50+1PM) Has anybody checked via J0-burg? That's all I've got--anybody with more? There are a couple of other flight options, including one leaving MRU at 1025. Here's the Air Madagascar timetable and the Air Mauritius website. Makes sense but why would they get the FF envelope at the Intersection? If they have do to the Intersection first wouldn't they not receive the FF envelope until they've complete the Intersection? Added conflict! While completing a task with another team, the cooperating teams make quickly become adversaries as they compete for the FF. What about the getting out of Dodge flights? TNR via where to Helsinki? Through Paris or Jo-Burg, maybe? It's hard to get a grip on the schedule because production seems to taking it easy on the racers (extended pit stops). I'll help you peach, just waiting on more clues . CBS is NOT co-operating . Maybe if we could spot the BQ confessional--on the other side of Lac Anosy from the hotel--then the other confs (including the Chos) might be nearby viewpoints. I think that is up by that burned out building. This is the view from the Hilton. I have a better pic but it's in a format that I can't convert for some reason. I found a building with the excact same color blue door but the windows don't match. Maybe there was a "blue light special" on paint in the area. I'd be really interested in finding the background for R/K confessional so we could tell which team was there first. Edited: Here is a beautiful, but large, view of the part of the hill from the lake. CBS heard us! We have Cow lips? *The game's newest twist shocks the racers and forces rival teams to set aside their differences and work together. *One team starts the leg with a huge handicap and will need to pull out all the stops in order to stay in the game. *The racers also struggle to complete an unappetizing task of consuming a local delicacy. *Every second counts as several teams run neck-and-neck in a race to the mat. So far in the Race (with on exception) thay have had the serious food cahllenges at the last part of hte race. S1; Osterich Egg literally meters before hte pit Stop. The only time it hasn't been right before the Pitstop (and it kind of was in its own special way) was in the first episode of htis season. When it was the first task. But it was right before an elimination point. So I am guessing travel to new country. Due Intersection. Open clue, which offers the last Fast Forward of the race, tehn teams must go to a roadblock (and have no real detour) or due both with the roadblock being thelast tasks before arrival at the Pit STop. Since we see Erwin and Godwin in the clothes of Mary & David, I assume that Mary and David only gave them that while they waited for their penalty to finish (with a small number of exceptins teams aren't allwed contact with eliminated teams. Unless their is a penalty involved or a close finish where the two teams are right on top of each other (season 7 had three of those). And once eliminated you are supposed to share belongings or money with other teams. I assume with Mary's comment about David eating cow lips that they managed to get a leg up on some teams here. I then imagine the race to the mat between teams is one of these two combinations. D&K versus Ly and Karlyn (which I think likely) because if it was D&K versus the Cho's they wouldn't have enough time in my opinion to give the Cho's their clothes if they were just moments in front of D&K. That of course if the race to the mat is the last bunch to the mat (and not just a random race to the mat sometime with any of the 6 teams. I would also guess though waiting on visual clues that its Rob and Kimberly or Tyler and James who compete for the fast forward. They are the only teams that are friends (and not part of hte sixpack) that have worked together. And would really be the first tiem they have had to compete directly for one thing. So what do you think is the order the teams will arrive this leg??? I guess it depends on if that green ticket is a Fast Forward or just the color of the new Intersection clue? In Kandice & Dustins pitstop confessional it looks lighter out vs Rob & Kims. Doesn't mean they were filmed in that order though or am I wrong? I've found a decent Tana map here but I can't link to it; just click on the Tana "center" map. Working backwards from the Hilton, I'm guessing the confessionals are in the Andohalo area (does everything start with an- or am- ? :hlol). Compare the hill behind R/K and the BQ Anosy viewpoint (source page). The cathedral, maybe? Usually confesionals aer done right after a team has its Mat Chat with Phil (DAMN YOU CBS and SPRINT). Though of course things like bathroom breaks can happen first. And a few minutes to relax. Well the Cho's had time to put the Kentucky's shirts on, lol. I don't know I'm stuck on the Fast Foward..is it or isn't it? Say R/K & J/T go for it then only one gets it, well waht happens to the other team? do they do " beds" by themselves? Thanks Slowhatch ..racking my brain cells trying to get a better shot of those cliffs,like Sups I can't get the angle. What is the building with the 4 rectangular towers?